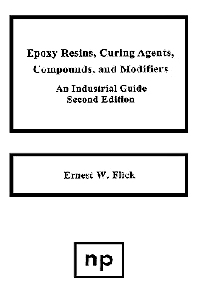 Users and manufacturers of epoxy resins, curing agents, compounds and modifiers. Epoxy Resins Ciba-Geigy Corp. CVC Specialty Chemicals, Inc. Dow Chemical U.S.A. Hoechst Celanese Corp. Polychem Corp. Reichhold Chemicals, Inc. Rhone-Poulenc, Inc. Shell Chemical Co.
Curing Agents Ajinomoto Co., Inc Anhydrides and Chemicals Inc. BASF Corp. Buffalo Color Corp. Ciba-Geigy Corp. Cray Valley Products Inc. CVC Specialty Chemicals Inc. Dow Chemical U.S.A. Emerson & Cuming, Inc. Henkel Polymers Division Hoechst-Celanese Corp. Huls America Inc. The Humphrey Chemical Co. Leepoxy Plastics, Inc. Lindau Chemicals Inc. Milliken Chemicals Pacific Anchor Chemical Corp. PMC Specialties Group, Inc. Polychem Corp. Reichhold Chemicals, Inc. Rhone-Poulenc, Inc. Shell Chemical Co. Synthron, Inc. Union Camp Corp.
Epoxy Compounds Ablestik Laboratories Acme Chemicals & Insulation Co. A.I. Technology, Inc. Atlas Minerals & Chemicals, Inc. Bacon Industries Inc. Biwax Corp. Castall, Inc. Coatings/Composites Conap, Inc. Cosmic Plastics, Inc. John C. Dolph Co. Eastern Resins & Chemicals Corp. Emerson & Cuming, Inc. Epic Resins Fel-Pro Inc. Fiber-Resin Corp. Fibre Glast Development Corp. Fibre Glass Evercoat Co. Formulated Resins Inc. Hardman Inc. Hastings Plastics Co. Hexcel Resins Group ITW Devcon K-POXY Loctite Corp. Magnolia Plastics, Inc. Mereco Division Monomer-Polymer & Dajac Laboratories Permagile Industries, Inc. Plaskon Electronic Materials Products Research & Chemical Corp. Protective Coating Corp. Quadrant Chemical Corp. Smooth-On, Inc. Sonneborn Building Products Sterling Symplastics, Inc. Syon Corp. TACC International Corp. Thermoset Plastics, Inc. 3M/Adhesives, Coatings and Sealers Division TRA-CON, Inc. United States Gypsum Westinghouse Electric Corp. Zymet, Inc.